Compliance Central's mission is to differentiate ourselves as an institution built on Trust, Integrity, Good Governance, and Commitment to deliver exceptional value to its officers, customers, respective networks, employees at a cost effective price. We reach out and provide financial services to under-served and un-served customer segments. To be the premier customer focused company in the country recognized for its superior service, innovative products and attractive and cost effective process through optimal utilization of technology for service and product delivery. Our consultants are experienced and client focused professionals dedicated to your compliance needs. They are individuals with extensive (hand-on) experience in financial institutions' management, operations, internal controls and compliance. Compliance Central provides a leading AML/BSA software as an in house resource to the financial institution providing added security and ease of integration. Compliance Central is customized to fit institutions of all sizes and is scalable to address future systems, data sources or changes in risk profile. The software is used to comprehensively monitor the amount and frequency of transactions related to cash, wire, ACH, cashier, and monetary instrument transactions. The screening and filtering of real time data from transaction details prevent a breach of sanctions, embargoes or other measures. Compliance Central a proactive compliance solution allows for the identification of unusual transactions, patterns and activity. Since these will not be suspicious in all cases, this system allows financial institutions to have the ability to analyze transactions, patterns and activity to determine if they are suspicious in nature. Suspicious transactions, patterns and activity must be reported to competent authorities in accordance with local laws, regulations or rules. Monitoring of account activity and transactions flowing through a financial institution is one means of ensuring this role is fulfilled. Compliance Central has automated processes in place to screen payment instructions and client details against lists provided by relevant competent authorities. Real-time payment screening is the screening or filtering of relevant payment instructions prior to execution. While it is critical that screening is undertaken on a real-time basis in order to block affected payments before completion, it can adversely affect Straight Through Processing (STP) and therefore requires timely responses by relevant competent authorities to financial institution requests for clarification in order for payments to be completed within the time periods specified by the clearing and settlement systems. Transaction monitoring should be embedded in an institution's integrated anti-money laundering program and the appropriateness of an institutions transaction monitoring framework should be assessed using the principle that the framework should be aligned to, and focused on, the perceived risk relating to an institutions business model, the products and services it offers and the nature of its customer base. Compliance Central ensures a risk-based approach which enhances the effectiveness of monitoring for unusual and potentially suspicious activity, to the extent that such activity is distinguishable from legitimate activity. - In all cases the objective is to try and focus monitoring resource on the most unusual and potentially suspicious transactions and patterns of activity whilst reducing, as far as possible, the "false/positive" rate. Financial institutions should ensure that the existence of a transaction monitoring framework does not result in a reduction of staff vigilance. Experience and analysis has shown that suspicious activity is frequently identified in circumstances that either do not lend themselves to automated surveillance or cannot be replicated within transaction monitoring frameworks. This means that a continuing emphasis on staff training and awareness is required, particularly focused on customer facing staff. Operational experience with automated transaction monitoring systems has demonstrated that their effectiveness is significantly affected by the availability of intelligence and typology information that can be used to devise and calibrate the rule set. Compliance Central performs retroactive searches during ongoing risk-based due diligence, and or as an element of enhanced due diligence pursuant to its policies and procedures. Retroactive searches may also be the result of requests by governmental authorities or the issuance of judicial processes that require financial institutions to search for specific data. To ensure consistent results, and where possible and appropriate, a financial institution should apply uniform processes and procedures for entering search criteria. When a financial institution engages in retroactive searches as a result of its own policies and procedures, care should be taken to ensure that such searches are risk-based and that they are performed against those data sources that will allow for the most effective and efficient identification of relevant data based on the risks associated with the customer or transactions. We can help your organization to (1) implement an enterprise-wide BSA/ AML compliance program for specific compliance functions; (2) assess your institution's BSA/ AML risk on a consolidated basis across all activities; (3) develop risk-based policies, procedures and processes from your organization's risk assessment, and (4) training on an annual, and on-going basis. We will identify and measure the risk associated with your organization's products, services, customers and geographic locations. We will evaluate your organization's BSA/ AML policies, procedures, systems, and internal controls; and determine the adequacy of your organization's risk-based BSA/ AML compliance program. We will assess the adequacy of your organization's systems to manage the risk associated with foreign correspondent account relationships, including management's ability to implement effective due diligence, monitoring and reporting systems. We will conduct an annual independent review and testing for compliance and provide a comprehensive report that includes but not limited to: (1) the scope of the review and independent testing; (2) an evaluation of your organization's BSA/ AML program components (e.g. 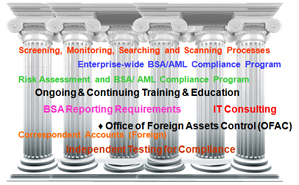 customer identification program, OFAC, BSA recordkeeping, information sharing, internal routine and controls, integrity and accuracy of the institution's information and communication systems, Board and senior management oversight, training, transactions monitoring, and suspicious activity reporting); (3) testing with the use of statistical sampling methods; and (4) risk rating of your institution's BSA/AML compliance condition based on rating categories used in the industry. We will assist your organization to address the critical elements of an effective BSA/ AML training program. In this regard, we will design the training program and implement it by providing hands-on on-site training for selected personnel and functional arrears. We will assess your organization's policies, procedures, and processes, and its overall compliance with statutory and regulatory requirements for monitoring, detecting and reporting suspicious activities. We will review your organization's currency activity reports, significant balance change reports, funds transfer and monetary instrument records, law enforcement inquiries and requests any responses to them, the SAR decision making and Board notification processes, SAR quality, timely filing, and its record retention. We will assess your organization's policies, procedures, and processes, and its overall compliance with statutory and regulatory requirements for monitoring, detecting and reporting currency transaction report. We will review your organization's currency activity reports, significant balance change reports, funds transfer and monetary instrument records, law enforcement inquiries and requests any responses to them, CTR quality, timely filing, and its record retention. We will assess your organization's risk-based OFAC program to determine its adequacy for the organization's OFAC risk, taking into consideration its products, services, customers, transactions and geographies. We will evaluate the effectiveness of your organization's internal controls for identifying suspect accounts and transactions and reporting to OFAC. 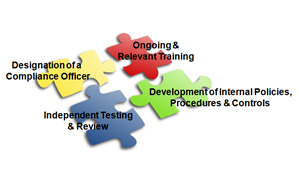 We will (1) assist your company to license and register as a MSB at the state and federal levels; (2) prepare BSA/ AML policies and procedures customized to the specific activities of your MSB; (3) develop training program's for your company's personnel; (4) assist with compliance and regulatory issues; and (5) assist in identifying a financial institution that may be interested in providing services to MSBs. 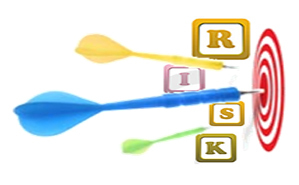 We will also (1) conduct BSA/ AML risk assessment of your MSB's customers, products and services, and geographies; (2) review and test your MSB's compliance with anti-money laundering/anti-terrorist financing laws and regulations; (3) prepare comprehensive reports for submission to your MSB's existing and prospective banks, if required; and (4) IT Consulting.